Feng shui is called Fung Shway-literally means wind and water. Popularly known as Chinese Vastu Shastra in India. Having originated nearly 4000 years ago in China, it is practised and used across the globe. There is a big mis-conception in India that placing objects like wind chimes, laughing Buddha, money frog etc. is feng shui. In layman’s language it is the art of using a place. It evolved from the observations that people are affected for better or worse by their surroundings. The location of mountains, lakes, rivers, buildings or roads, the orientation & placement of room and furniture with in office or home can influence wealth, health and relationship with others. There are two schools of Feng Shui commonly practised namely: -	Landscape School using Four Animal formation and landscape Feng shui -	Compass School using Eight mansions formulas The Advanced disciplines for great accuracy are: -	Flying Star Feng shui- using Time dimension -	BaZi- Four Pillars of Destiny using person’s destiny analysis The Basic principles governing Feng Shui are: •	Chi or Pran Vayu the vital force or energy connects and activates everything .It is the vital force of Universe. Poor flow and bad quality of chi brings misfortunes and critical imbalances in our homes and body. •	Universe comprises five elements namely Earth, metal, Fire, wood and water and these five elements have three cyclical relationships: - A productive cycle - A destructive cycle - An exhaustive cycle •	There are Eight directions- four cardinal and four non-cardinal namely East, West, North, South, South-east, North-east, north-west and southwest. All the eight directions represent some elements and accordingly their usages are defined. In advance studies we use 24 direction analysis. •	There should be balance of Yin( the feminine) and Yang ( the masculine) as depicted by the famous Tai-chi symbol .Like night is yin and the day is Yang. Whenever either yin or yang increases disproportionately, the imbalance is created. The above analysis gives us a quick view of what is Feng shui .Now we will analyse How Feng Shui helps in designing Office. All of us spend most of our working time in our offices and it is always desirable to have positive and energetic working environment in the office to achieve the best results. Here the need for Feng Shui arises. It helps us in following ways: 1. Selection of office 2. Balancing the five elements 3. Correcting and improving the flow of “Chi”-the energy pattern 4. It creates most congenial, wonderful and auspicious environment in the office which has dramatic effect on the productivity and level of harmony in associates and staff 5. Increases customer satisfaction level and loyalty 6. Thus brings recognition, promotion and wealth. Step-1 to have a good Feng shui-ed office Selection of office site ( exterior) •	The square and rectangle are the best shapes to use. In case of rectangle a ratio of 2.5:1 is desirable. •	Avoid irregular shapes like rhombus, L-shape, U-shape, round, triangle etc. Triangle should strictly be avoided. For other shapes remedies are available to some extent. •	Avoid office space having some missing corner •	Office spaces near Church, Temple, Hospital, Police stations, abbatoirs,cemetery, Electric stations, big poles, transformers, big tree, at T junction or Y-junctions should be avoided. Although remedies to some extent are available. •	Staircase/ elevator should not face main entrance directly. A staircase heading upstairs is good as it indicates your fortunes moving upwards. •	Better to avoid office at the dead end of corridor Step-2 Face your Sheng Chi direction ( Best Direction) •	Unless you have direction in your life, the destination or the goals can not be achieved. Some saint showed the right direction to move to Mr.G.D.Birla and the rest is history. You should face your best direction. •	To find out our best direction, we need to calculate the KUA number using the Eight Mansions formula. Note KUA number ranges from 1 to 9. • Formula for calculating KUA number For Male: Take last two digits of your year of birth and add them together. Keep them adding till you get single digit number. Deduct this from 10 if you are born before 2000 and from 9 for those in the year 2000 or later. This gives KUA number. For Female: Take the last two digits of the year of birth and add them together .Keep adding till you get a single digit number. Add 5 to this number if you are born before 2000 and add 6 for those born in the year 2000 or later. If the result is a two digit number, keep adding till you get a single number. This is your KUA number. •	Select your Sheng chi direction from the following table KUA NUMBER	SHENG CHI DIRECTION 1	South East 2 North East 3 South 4 North 5 For FEMALE	South West 5 For MALE	North East 6	West 7 North West 8 South West 9 East The above table provides the Sheng chi ( Best direction) for various KUA numbers. Facing your best direction gives you an edge in your working and interactions with various people. Make this a life long habit. The same direction can be used in interviews and outside meetings also. It is advisable to carry a small compass with you while traveling. In case of doubt do consult with experienced consultant. STEP-3 Sitting Arrangements and Furniture •	NEVER SIT WITH YOUR BACK TOWARDS THE DOOR. When you sit your back towards the door, it is like things go on “behind our backs,” including backstabbing and being talked about. Facing the door is like actively facing your life. It is however of utmost important to make sure that while positioning you must not be in direct line of doorway. There the chi force would be too taxing. This layout weakens our nervous system and raises our stress and blood pressure level. Some Good sitting positions •	The back of the chair should be placed such that there is solid wall behind you. Sitting with your back to the door must be avoided. Also a window behind you is bad. Close that window with heavy blinds or curtains. •	Avoid sitting facing a wall, it acts as a barrier to growth. If this arrangement can not be changed, then place a scenery of open green field in front of you. •	Avoid sitting beneath a beam. It has ill-effects on your health and mind. •	Position your desk so you are not directly facing anyone else. It is better having your back to someone than to be positioned facing another person directly. It brings confrontation and also your energies get depleted. •	Do not sit near to the door. The secretary should sit near the door to protect the employer from having to deal with mundane matters. •	The chair of the owner should be the biggest one. The chair should have proper back support as well as arms i.e. these should follow the “Four animal formation” in Feng Shui. The chairs of visitors should be smaller and there back should be to the door. These need not be overly comfy. •	The table of the owner should be the biggest one in the office. The table should have round corners. Some auspicious dimensions as per Feng shui are: •	59.1 to 64.5 CM •	145.1. to 150.5 CM •	Look for sharp edges and corners pointing at you. These are called “poison arrows” or “sha” in Feng shui. These are continuous source of irritation in our concentration as also harmful for our health. All the sharp edges and corners should softened by making them round or should be hidden or deflected by using mirrors, plants or screens. •	Open bookshelves should be avoided. They are treated as poison arrows in Feng shui. Step-4 Directional use •	North-east is the best place for “Pooja Ghar” •	North-east is the direction of knowledge thus excellent place for our tools-books. •	North-west and west are metal directions and are good place for computers. •	East, south-east, south representing wood and fire zone are good for staff kitchen and pantry. •	Ideally stairs should not be positioned in north, north-west and centre of the building. •	Always difficult to place toilets. Toilets should never face the entrance of the office. They should preferably be placed on an outside wall or if internally sited, ventilation must function efficiently and bathroom doors should be closed all the times. •	The energy of North is good for secret negotiations. It is perfect direction for meeting/consultation rooms. 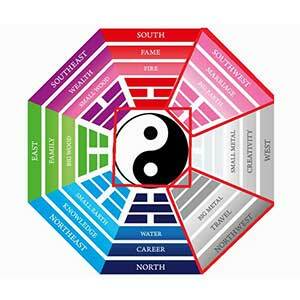 •	South-east is regarded as direction of wealth in feng shui. Keep this zone very neat and adding healthy plants here does wonders. STEP-5 Clear the Clutter A clutter free office environment is essential and work spaces should be clear of everything but the task in hand. Do not have stacked filing trays which symbolically and literally, allow the work to mount up. Deal with letters and telephone calls the same day and note conversations and dates meticulously. Discard catalogues as new one arrive as well as out of date paperwork. Usually our offices have following type of clutter: •	Piles of used papers • Piles of read or unread journals •	Out-of-date books, newspapers, files •	Cluttered hard drive •	Broken equipments •	Notice boards with out of date information •	Unusable stationery items •	Unwanted documents , untidily stored into drawers and cabinets •	A good habit should be to devote at least 10 minutes daily to remove the clutter. You will be overjoyed by working in a clutter free atmosphere. These very small guidelines will certainly change the whole atmosphere in your office and will go a long way to improve productivity and prosperity for you. 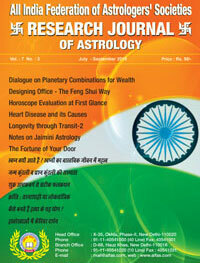 In this issue of Research Journal the majority of articles are on predictive techniques in astrology like Dialogue on Planetary combinations for Wealth, Designing Office: Fengshui way, Horoscope Evaluation at First Glance, Heart Disease and causes, Longevity through Transit, Notes on Jaimini astrology, The Fortune of your door, Why Dreams? significance of Dreams, Birth Chart and Horary Chart, Prediction from Shukrashtakvarga, Revolution, Planetary Yogas of Murder, Knowing Career through Palmistry etc.